The split air conditioning unit PT 6500 S including the heat exchanger and connection set. 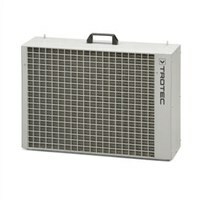 The commercial air conditioning unit PT 15000 S with maximum performance and robust construction. Extern heat exchanger for the split air conditioning unit PT 6500 S (at least 30 m distance). We find that our air conditioner must be robust, portable and affordable. This is not only the performance of "cool": The PortaTemp air conditioner is designed for professional applications. Wherever it's needed it brings cool air quickly and easily. For example, at trade fairs and exhibitions, festival tents or in storage and production areas. Since these devices were made for cooling at different locations, they are compact, robust and easy to transport. We provide powerful air conditioner with professional quality and different cooling capacities. Choose from our range air conditioner that suits your requirements. In addition to the mobile variant, or to the split air conditioner you will also find accessories in our webshop- and of course a fast, uncomplicated service. You need help for calculating the cooling demand? With this online calculator you can find the perfect air conditioner for your personal needs!